The members of the Ortholasmatinae are among the most spectacular and ornamented in the Dyspnoi. The dorsum of most species is covered with anvil-shaped tubercles that have long horizontal arms intersecting with each other and forming individual geometric patterns like combs, squares or finer reticulate patterns. In most species, the eye tubercle is drawn out to a long spine that is set laterally with long tubercles that are joint at their tips. Together they form an ornamental and elaborate basket over the chelicerae. Genital morphology, which is quite uniform, has not been evaluated as character for systematic placement. The penial truncus is mostly parallel-sided and tapers into very short glandes that are set with spines and, in some groups, with thick thorns. The penial stylus is mostly long and massive; the tip is deformed, often as a flat, diagonal knob (Shear and Gruber 1983). Distribution is unusual for Dyspnoi, extending into the tropics of Central America and Asia, covering a wide range with disjunct distribution in Thailand (Schwendinger and Gruber 1992), Japan (Suzuki 1974) and Central and western North America (Shear and Gruber 1983, Shear 2010). The systematic placement of the group is based on external characters such as ornamentation, which partly matches with geographic distribution (Shear 2010). Phylogenetic relationships have not been investigated in detail, but one can assume the existence of two groups based on genital morphology and geographic distribution, which fit with the old and wider generic concept of Ortholasma and Dendrolasma (Shear and Gruber 1983). Shear (2010) narrowed the generic concept and reestablished Trilasma which, together with Ortholasma, exhibit male genitalia with long, slender spines on the penial glans and a deformed, blunt stylus tip in most species. Martensolasma may fall into that group based upon the same characters supported by a cohesive geographic distribution of the three genera from central-western North America to Central America. External features are reduced in Martensolasma and Shear (2010) assumed an isolated position within Ortholasmatinae. The second group comprises the North American Dendrolasma and Asian Cladolasma, exhibiting a pointed stylus and additional massive and short spines on the penial glandes. Shear, W. A. 2010. 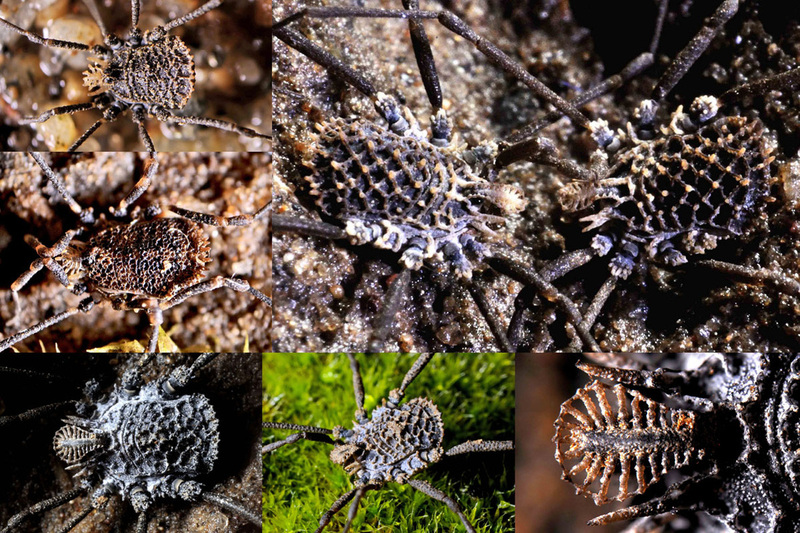 New species and records of ortholasmatine harvestmen from México, Honduras, and the western United States (Opiliones, Nemastomatidae, Ortholasmatinae). ZooKeys 52:9-45. Shear, W. A. and J. Gruber. 1983. The opilionid subfamily Ortholasmatinae (Opiliones, Troguloidea, Nemastomatidae). American Museum Novitates 2757:1-65. Schwendinger, P. J. and J. Gruber. 1992. A new Dendrolasma (Opiliones, Nemastomatidae) from Thailand. Bulletin of the British Arachnological Society 9(2):57-60. Suzuki, S. 1974. Redescription of Dendrolasma parvula (Suzuki) from Japan (Arachnida, Opiliones, Dyspnoi). Journal of Science of the Hiroshima University, Series B, Division 1 (Zoology) 25:121-128.